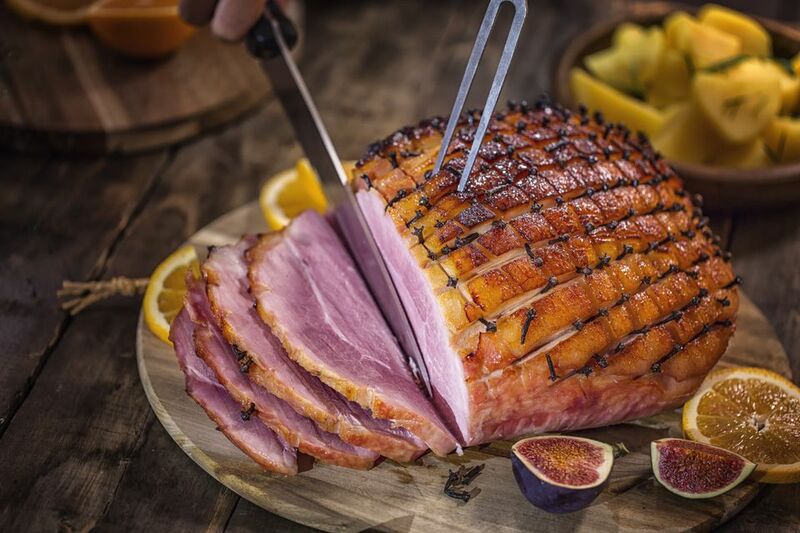 Glazing a ham is a great way to add flavor, color, and texture to a baked ham. It's not hard to do, and you can make a simple and delicious ham glaze from some very basic ingredients that you probably already have in your fridge or pantry. Glazing a ham involves using some sort of sweet ingredient, which is usually combined with a fruity, tangy or pungent ingredient. These sweet, fruity, pungent flavors really complement the salty flavor of the ham. You want to leave the glaze on the ham long enough for it to caramelize, but not so long that it burns. And sugar burns quite easily, so you only want to apply the glaze to the ham during the last part of cooking. Otherwise, your glaze will turn into a smoky mess. For the most part, when we bake a ham, we're simply reheating a ham that's already cooked. Hams of this type are called ready to eat or ready to serve hams. For that reason, lower temperatures and longer cooking times will work fine. Temperatures of around 325°F to 350°F are perfect. Because the temperature is so low, we can simply apply the glaze to the ham about 30 to 60 minutes before the ham is finished cooking. To apply the glaze to the ham, you can use a heatproof spatula or a pastry brush. When it comes to pastry brushes, I prefer the silicone kind, because they don't shed their bristles when they get old, but you can use whatever kind you prefer. A spatula will work for a thicker glaze, as you can simply smear it over the ham. But for a more liquid glaze, you'll need to brush it on. There are a couple of techniques for glazing the ham. For a larger ham, say 15 pounds or more, you can apply the glaze in stages. For instance, let's say you mix up a one-cup batch of one of the ham glaze recipes below. You could apply 1/3 cup of glaze about an hour before the ham is done. Then 20 minutes later you can apply another 1/3 cup, and then the remaining 1/3 cup 15 minutes after that. For a smaller ham, it's fine to apply the glaze all at once. But here's another tip: You can make your glaze sweeter and more glossy by brushing the glaze with honey or maple syrup after about 30 minutes. As a matter of fact, if you want to be really minimalist, honey or maple syrup alone will make a simple but tasty ham glaze. Before we get to the recipes, a note on cloves is in order. Many recipes call for studding a baked ham with whole cloves. But in the culinary arts, there is a convention that says that all garnishes should be edible. And no one wants to crack a tooth biting into a whole clove. Even so, studding with cloves is traditional, and it adds to the presentation. So if you decide to go this way, do take care to ensure you remove all the cloves (and fragments thereof) before carving. Otherwise, simply add a few ground cloves to the glaze. Combine all the ingredients in a small bowl. Apply to the ham about 30 to 60 minutes before the end of cooking.